He took the job under a cloud of controversy less than four months ago, trying to stem the flow of ugly headlines out of West York. Now, Mayor Shawn Mauck wants to stick around to oversee the progress of his borough. West York Mayor Shawn Mauck is running for election this year. Mauck replaced Charles Wasko as mayor in October, after the former mayor posted racist comments online, then resigned. Mauck announced his first campaign for mayor over the weekend, saying he will work to rebuild a government that works for its citizens. 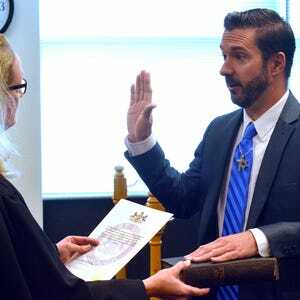 Mauck made the step up from borough council president in October, replacing former Mayor Charles Wasko, who was forced to step aside after posting racist comments on his public Facebook page. After taking over from Wasko, Mauck focused on his first 100 days in office instead of looking toward the future. His 100-day plan included passing the borough’s first-ever tax cut, creating a junior West York Police Department for kids interested in careers in law enforcement and expanding the services the borough provides to its residents. With those first few initiatives accomplished or under way, Mauck has declared his 100-day plan successful and is turning his attention toward the next four years. The borough has a solid foundation to build on, now that it’s operating out of the former Grace Loucks Elementary School, Mauck said. “(The building has) given us a whole new platform to do business differently than we have in the past,” Mauck said. Community engagement: If elected for a full term, Mauck said, he would work to get residents more involved in their community by encouraging them to come to borough meetings and helping the council to “open up a dialogue” with them on a more regular basis. Mauck said he enjoys working with residents to understand their needs and is happy to continue putting forward initiatives and programs to improve the borough. Mauck said he will look to protect residents from “reckless decisions” and ensure the borough’s roads and infrastructure systems are repaired and maintained properly. “There’s still a lot of problems that need fixed, and they need serious solutions,” Mauck said. The fallout from Wasko’s resignation showed Mauck that many residents who had been left behind under the previous leadership just wanted someone at Borough Hall to hear their concerns and needs, he said. Creating change for West York residents is more about understanding and cooperation than finger-pointing and bickering, Mauck said, though he’s not afraid to step on a few toes to improve the borough.